They’re back in stock and more popular than ever! The e.l.f. Clay Eyeshadow Palettes sold out quickly upon their first release, and since they were limited edition the brand announced they weren’t planning on restocking. But they are now back on the elf website, so everyone’s getting another change to grab them. There are four palettes that make up this collection, and I can’t help but praise elf for what a great job they did in curating the shades in each compact. 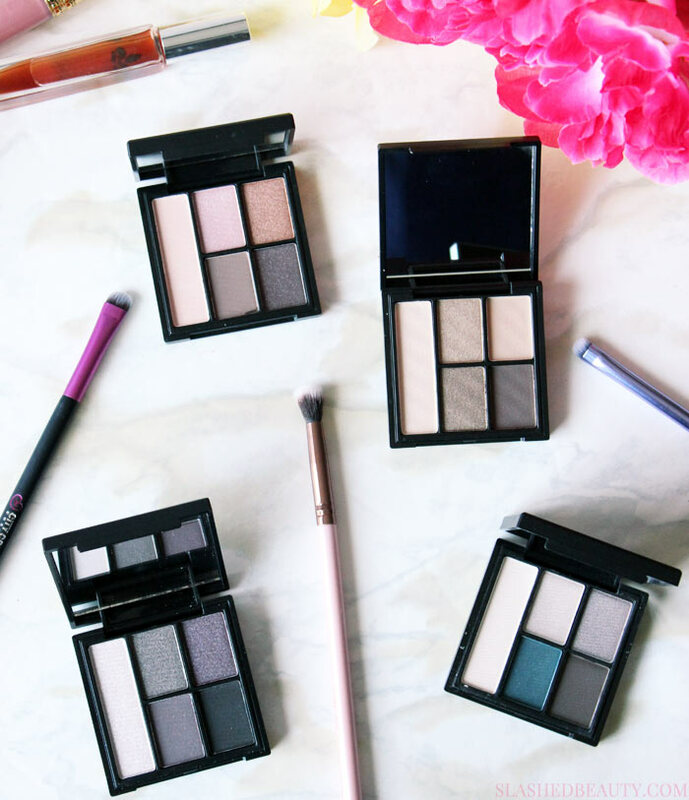 We get an awesome balance of matte, shimmer and satin finishes with colors that not only compliment each other, but come together to complete several full eye looks. Pigmentation is pretty good across the board. The shadows are made with Kaolin Clay which makes them buttery soft and easy to blend, but also helps their wear time— even with oily lids. Even the matte shades, though sometimes powdery, provided good color payoff that was build able. My favorite of the four palettes was Saturday Sunsets because it had the most consistent color payoff in all five shades, with beautiful rosy neutrals that are in-style year round. 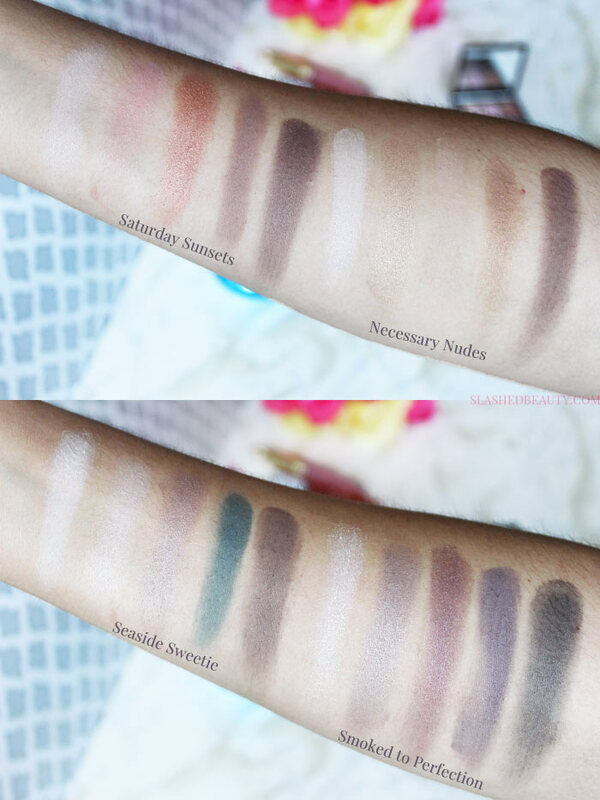 Smoked to Perfection was the odd one out, with only one matte shade and colors that didn’t perform as well. Even though the purple shades are beautiful in the pan but don’t quite translate to the skin. Throughout the palettes, the satin finish shades were my favorite with a beautifully smooth application and strong color on one swipe. You can take this palette from every day to night-out very easily. With the $2 e.l.f. Shadow Lock Primer, these did in fact last all day without creasing on me. I would say I have slightly oily lids, and the shades looked beautiful from morning to night. I was actually sad to take it off at night, since my makeup looked just as #onfleek as it did when I applied it. As an aside, I think it’s important to note that the pans are NOT magnetic if you planned on deporting them and putting them in a Z palette! I’ve been mixing the shades across palettes so thought it’d be easier to combine all the shadows, but alas, they did not stick in the palette. For only $6, the e.l.f. Clay Eyeshadow Palettes are really versatile, cute, and cleverly designed. The must-haves in the line are Saturday Sunsets and Seaside Sweetie, which together will deliver a ton of great color combinations. 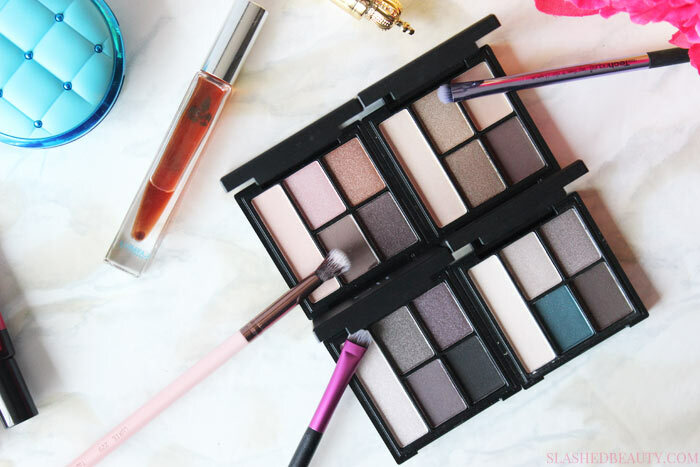 If you struggle with creasing eyeshadow when wearing other formulas, this one is worth a go! Did you think these palettes would show up on darker skin tones? I would say probably for Necessary Nudes and Saturday Sunsets– not so sure about the other two! I have Saturday Sunsets and Necessary Nudes. I’m pretty happy with them. I actually have quite a problem with oily lids and need a primer. My container from my naked palette is running out, and I’ve moved away from all sephoras and ultas! Whatyour favorite drugstore eye primer?